The combination of Donald Trump's speech to the Republican National Convention in Cleveland, Ohio and Wikileaks' dump of emails on its Democratic counterpart suggests we are entering a disturbing phase in US and international politics, whatever the result of the US presidential election. Let's first consider Trump. Various people have noted with alarm the racist and authoritarian tone of his speech, with its promise of safety which only he could bring. Indeed, his speech has uncanny echoes of that of Hitler to the Reichstag in 1933, setting out a wish list to be achieved under a Nazi government: safety, economic security and a redress of perceived historical grievances — especially against foreigners and people of other ethnicities and religions. Interesting, too, that Trump (despite being a man of considerable means) cried out against the evils of capitalism and preached economic and political protectionism at the same time as hatred and fear of the ethnic and religious other. So, not just a nationalist agenda, but an avowedly national-socialist one. The choice should therefore be an easy one — and this is indeed what many in the media have been saying. The consistent cry has been to vote for Clinton, since whatever her failings, they cannot compare with the risks inherent in putting someone with as little respect for democracy as Trump in charge of the world's largest economy and military, not to mention access to nuclear weapons. Unfortunately, it is not hard to see why people (especially those without much knowledge of the history of such thought) have fled to Trump as a breath of fresh air. I have previously noted that his campaign capitalised on the increasing vacuousness of America's politics, with big money officially enshrined as part of American elections leading to increasingly bland, corporatist policies characterising both parties. It is into this context that the latest Wikileaks dump springs. While there had been repeated allegations of vote rigging of the Democratic primary (all angrily dismissed by Clinton's team), the latest cache of emails provides damning proof of just that. Far from being the neutral brokers they claimed, the emails show beyond doubt that Democratic National Committee (DNC) officials actively conspired with Clinton staffers on how to exploit everything from Sanders' Jewishness to his campaign organisation in order to rig the primary in her favour. 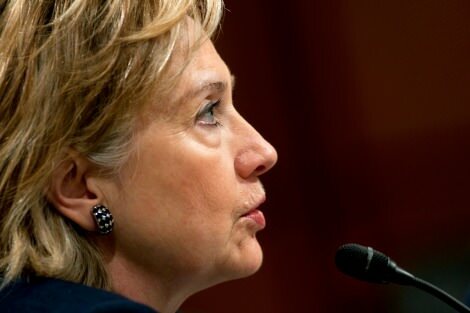 Clinton had persistently faced questions as to her judgment and links to big business. Now, however, her closeness to establishment figures and the exclusion of outsiders from the circles of power upon which Trump played so successfully in forging his poisonous rhetoric has, in one fell swoop, been shown to be even more pervasive than even he had alleged. "If Putin was behind the leaks, Americans should surely be grateful to him for doing the work which their own journalists couldn't or wouldn't do." Significantly, the media and Democratic campaign team's response has been not to deny the allegations (the head of the DNC, Debbie Wasserman Schultz, has now resigned to join Clinton's campaign team as an official staffer) but to blame that ubiquitous bogeyman, Russian president Vladimir Putin, for the leaks. Given that the Democrats had (rightly) pilloried Donald Trump for attacking foreigners as a way of deflecting attention from his dangerously undemocratic ideas, it is surely delicious irony of a high order that the reaction of the DNC to having its own thoroughly anti-democratic linen aired in public was immediately to find a foreign scapegoat. Let us be clear: while Clinton's general hawkishness on Russia is well known, there has as yet been no evidence adduced that Russia was the source of the Wikileaks documents. Even if this were ultimately shown to be the case, however, the emails were not fabricated by the Russian intelligence services in some basement of the Lubyanka but are rather records of correspondence between Americans (which all sides admit to be accurate) showing them actually going about the business of rigging elections. If Putin was behind them, then, Americans should surely be grateful to him for doing the work which their own journalists couldn't or wouldn't do. Revealing this kind of thing in the Soviet bloc was exactly what America proclaimed to be a public service during the Cold War. Indeed, they established radio stations (such as Radio Free Europe) for this very purpose in order to circumvent the totalitarian propaganda of the other side. As the US goes through its convention season, it is becoming increasingly clear that the choice is between someone spouting decidedly undemocratic and possibly fascist rhetoric and someone for whom democratic decision-making is, at best, something to be evaded with as little scrutiny as possible. Both parties are moneyed and both seek foreign scapegoats upon which to direct media attention. November is shaping up to provide a distinctly unpalatable choice. Excellent article. America not only beamed info into Russia in Soviet and post-Soviet years. It also got heavily involved in supporting Yeltsin's presidential election campaign in mid-90s against a dangerously popular Communist rival Zhuganov. Sauce for the goose .... But as you say, we don't know that Russia hacked and released the DNC emails. Much of what you say Justin is factually true, but the dangers of Trump tor the common good cannot be under-estimated. Nor should his links to the Russian power and financial structures; he has been dependent on Russian funding for his business "deals" for a decade since Western banks shut him out as too risky. It is those linkages the need to be focused on and not the internal machinations of the Democratic party, which are probably cleaner the they have ever been. Whatever choice America makes is so much better for Australia than to hitch our wagon to Russia, China or India. Corruption seems endemic in ANY power group. Europe has ceased to be a significant world influence. To "Hate America" seems an easy dominant catchcry. But who else is there? Who but America shares our values? Who but America can help us resist? Australia cannot stand alone and we already punch above our weight. We cannot throw stones. Reality is a hard teacher. Good article Justin. A chilling choice for Americans in reality. After the intelligence and humanity of Obama, we are faced with good old fashioned totalitarianism, or a candidate who is a slave to big business and the military hawks. I think your analysis is sadly very accurate, Justin. Americans are presented with a very stark choice during the current presidential election - a Republican, Donald Trump, who sounds very much like a demented fascist, and Hilary Clinton, whom many consider to be a war criminal because of her actions as the former secretary of state. Her family has made huge profits out of arms sales that she made to Saudi Arabia - hardly the most democratic and human rights respecting nation in the world. These problems are not new, however. Dwight Eisenhower warned Americans that the US Military Industrial Complex (MIC) was taking over their democracy before he retired as president. Many believe that the US MIC, made up of extreme right wing militarists, industrialists and fundamentalist Christians, has been dictating the US agenda for some time and has kept the US on a constant war basis since World War 2. The best choice for Americans in the coming election is Jill Stein, the US Greens presidential candidate as she is anti war and pro environmental care and human rights, but there would have to be a miracle for her to be elected as she has been frozen out of the US media. Let's hope, Justin, that when whichever of this disingenuous pair becomes president and is faced with the obligations of responsibility that he or she rises to the challenge. Many great leaders have been inconspicuous until they suddenly found themselves charged with responsibility. Somehow, however, I think that either of them is more likely to continue the downhill charge of America, waving their sabres on high, to the depths of immorality and self-destruction, dragging Western civilisation along with them. All together now, with hand on heart, "God love America"! The arguments are well made, but I baulk somewhat at the implication that Trump and Clinton are as bad each other. Trump is inexperienced, a racist and is sexist. Clinton is experienced and tarnished. But she is not a racist and she certainly has been tenacious in tackling sexism. The fact that she has broken through, even at this stage, the hard glass ceiling is something to be lauded in Western society. So, I will side with Michelle Obama and conclude that Clinton has some merit and Trump has almost none. From 1789 to 1791, the Americans abandoned the British system of considering all important issues in the court of the legislature, where issues are never concluded once and for all but can be re-investigated by a future legislature, for a system in which (because of the accident of the passive acceptance of Marbury v Madison) values once locked into a constitution by an unelected caste of legal priests could only rarely be changed, due to the judicial principle of stare decisis and the practical difficulty of getting constitutional amendments to pass. The constitutionalising of moral values has led to the matter of who sits on the Supreme Court (for terms that span generations) as being more important than who occupies the White House for a term or two. The moral case for Trump's one or two terms is the plain fact that Hillary Clinton is dangerous to the unborn. If elected, she'll appoint Judge Garland and possibly replace a retiring Justice Ruth Ginsburg, locking up a pro-abortion majority in the Court for decades. The naivety of eighteenth century Americans who believed that certain verities would always be believed should give pause to Australian attempts to constitutionalise a bill of rights. Donald Trump is a deeply flawed character, but it is difficult to give credence to those critics who can never detect the beam in their own eyes. For example, while accusing Trump of being a potential dictator, they never mention how Obama has actually trashed the Constitution by his Executive Decrees, by his refusal to prosecute validly passed laws, or by his use of the Taxation Department to target opponents. That truly is dictatorial. Ignored too is a totally politicized Supreme Court where “right” and “wrong” and “just” and “unjust” are not a question of objective morality, but a matter of who’s in power. McKinsey Consulting has found that real incomes have stagnated or declined in 65 to 70 percent of households in the developed world. These are the losers from a globalized economy. Yet the wealthiest people, Warren Buffett, Bill Gates, Larry Ellison, and George Soros et al support liberal causes and the Democratic Party. Similarly, liberal foundations like Mellon, Bloomberg and MacArthur Foundations outspend conservative foundations by at least 30:1 each year. Just as multinationals and elites favoured to Remain in the EU, it is the Democrats who are favoured by the wealthy globalized elites.